Some have described the Food and Drug Administration (FDA) as a scientific bureaucracy with police powers. Does a “cult of infallibility” exist within the FDA, leading to decisions that are contrary to the best interests of patients and their physicians?The Food and Drug Administration (FDA) is one of the most powerful of federal regulatory agencies, if not the most powerful. It regulates over 25% of all consumer goods sold in the United States. It makes decisions on a daily basis that affect the lives of millions of people.While the FDA was created to protect the public, how well is it fulfilling this mission and whose interests is it actually protecting?In this book, four outstanding scholars examine how the FDA accumulated its enormous power and what effects it has had on the public. 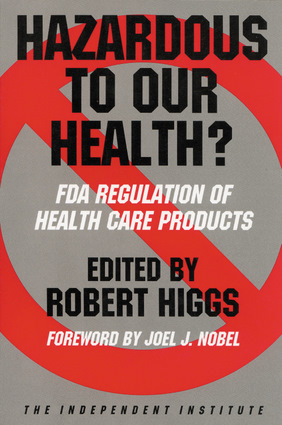 It also explores who actually benefits and loses from FDA actions, and whether alternatives exist to safeguard the health of Americans. This book raises serious questions about the wisdom of giving policing power to scientists with little oversight or appeal process, as the FDA currently does. It also argues forcefully that the FDA unnecessarily delays beneficial medicines and medical devices, many of which are routinely available in Europe, from being available to Americans. Robert Higgs is senior fellow in political economy at The Independent Institute and editor of The Independent Review. He received his Ph.D. in economics from Johns Hopkins University, and he has taught at the University of Washington, Lafayette College, and Seattle University. He has been a visiting scholar at Oxford University and Stanford University, and was formerly a fellow for the Hoover Institution and the National Science Foundation. Among his other books are Crisis and Leviathan: Critical Episodes in the Growth of American Government and Arms, Politics and the Economy: Historical and Contemporary Perspectives.